Looking for Lobby Signs in Maricopa County AZ? Regardless of whether you’re looking to relocate to a larger office space, or simply update the reception area you currently occupy, lobby signage is arguably the single most influential investment your company will ever make with regards to its physical location. Not only do lobby signs dramatically increase the overall professional look and feel of your site, but a dimensional letter lobby sign for your Phoenix business will also ensure your clients and customers are able to find you regardless of how many suites your building houses. Want an economical solution that’s easily moveable? Acrylic Panels could be just what you’re in the marker for; the most popular of which is comprised of shiny clear acrylic with logos and digital lettering imprinted on its face. However if you really want your sign to pop, consider adding some texture with dimensional letters and logos. We can also custom select a colored panel to compliment or contrast the verbiage. Interested in routed acrylic panes? Scrap the standard rectangular panel and let us custom shape your backdrop. At various thicknesses you can also customize the panes anywhere from 1/8"all the way up to a 1/2". We are also adept at specialty acrylic. Be it colored, textured or frosted we can use any number of combinations to enhance your lobby’s main feature. With a lightweight foam option, your crisp lettering will shine against your entry wall. And if depth is what you’re after, foam letters are by and large the most economical solution. Dress up the look with an acrylic face or add digitally printed elements for more visual interest. Our most durable option, metal laminate, is a fantastic choice for conference rooms and lobbies alike. Just because we keep things economical by foregoing the cost of real metal alloy, doesn’t mean we skimp on looks. We start by individually casting and cutting metal laminate letters from thin metal layers about .025” thick. Available in several colors, each is laminated in any one of our available finishes such as brushed brass, polished aluminum or soft satin gold. Modern, contemporary interiors just beg for acrylic cut letters. It’s no wonder these dimensional letter lobby signs in Maricopa County, AZ are so popular. Choose from dozens of standard colors, or request a custom paint job to match your branding scheme. We can also fit your logo and letters to the height most appropriate to your space, affixing them to the walls with either a simple silicone solution, or by mounting the letter backs for heavier jobs. Float off the walls a bit, or mount them flush depending on which aesthetic you prefer. And since the high-quality acrylic will last for years, you’ll eventually have to give them a little scrub. Signs can be washed with mild detergent and polished with car wax to help them shine. 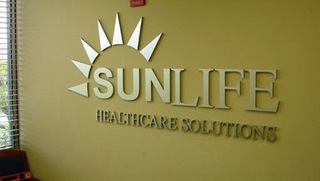 For years Spotlight Signs & Imaging has been helping our clients in the Phoenix, Tempe, Gilbert, Mesa and Chandler areas to optimize their branding strategies by customizing professional, grade-A lobby sign for their business. We are available every step of the way helping you select the materials, sizes, colors and styles which best represent your brand.